Canadian-born James Ehnes has thrilled audiences worldwide since his orchestral debut with the Montreal Symphony Orchestra at the age of 13. The recipient of numerous awards including a Grammy, a Gramophone and seven Junos, he continues to win superlatives for his artistry and impressive technique. Recent engagements have taken him to New York to perform the Brahms concerto with Valery Gergiev and the London Symphony Orchestra; to Aix-en-Provence for a solo violin recital; to Rotterdam, Birmingham, San Francisco, Toronto, and to Canada’s far north with the National Arts Centre Orchestra. 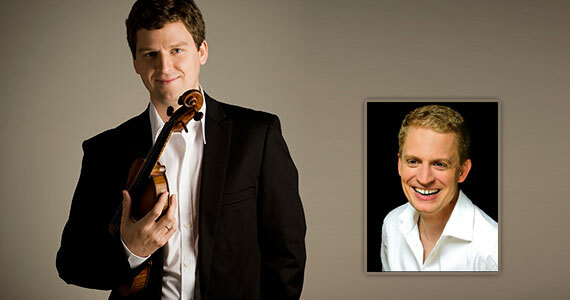 The American pianist Andrew Armstrong performs frequently with James Ehnes and has recorded with him two highly praised volumes of works for violin and piano by Béla Bartók. A prize-winning soloist, Andrew Armstrong has appeared with major orchestras in Europe and Asia and throughout North America.